One of the things that amazes most people about me is my grueling schedule. On the road 45 weekends a year, most shows have me virtually sold out for reading slots during show hours, meaning it’s nonstop. As soon as the show is over, I pack and immediately hit the road for home. Four days at home — sometimes as few as two if I am doing longer-duration shows — to unpack, do laundry, repack, answer emails and set up times for reading at home in the future. A kiss to my husband and I’m back in the car and heading for someplace new. My nickname of the Travel Channel by metaphysical colleagues is earned because of being on this show circuit. But even if you’re not planning to do that kind of travel — even if you are simply doing one or two shows a month in a smaller geographic area — you still have to take care of yourself. And the Care and Feeding Of A Psychic is vital to keeping your gift sharp and burnout at bay. How do I do it? Well, I have certain absolutes. Let’s first look at how I handle show travel. I stay at good-quality hotels; my personal choice is the Hilton chain. It has some lower-cost properties, chiefly Hampton Inns; but they are still very clean, very reliable, and very safe. I know the beds and pillows are comfortable, there are no bedbugs, and the walls are generally thick enough that I don’t have to listen to the TV or conversations from the room next door. Do they cost more than a Super 8 or Motel 6? Yes, they do. But a comfortable night’s sleep in familiar surroundings means that I am ready to go the moment the show doors open. Bonus: staying specifically at Hilton properties means I am now one of their VIPs (Hilton Honors program Diamond), and there are usually upgrades, perks, and other niceties when I walk in the door. Whether it’s the Hilton chain or some other hotel group you like, give yourself the gift of safety, a good night’s sleep and a reliable company reputation. I also generally refuse to stay with clients, however generously and kindly meant. Why? Because when I stay at a home that belongs to someone else, I’m always “on stage.” Invariably, I will be asked to talk about my work, perhaps do a reading off the cuff, be asked advice…whatever happens, I am still on parade, and can’t let my guard down until I am in bed. Even then, I’m a guest in someone’s house. It was wildly inconvenient a year ago when I got food poisoning and was up and down to the bathroom all night long, constantly worried I was going to wake up my hosts. Had it been a hotel room, I would have simply stayed in the bathroom all night until things passed. I drink water at shows. Not soda, not coffee — water. Flavored with a slice of lime and a slice of real ginger, it keeps me hydrated (show halls are notoriously dry), tones down headaches and keeps me awake. Yes, you can get tired and head-fogged if you are dehydrated. I make it a point of drinking at least two 20 oz bottles of water from open to close, and I’m far the better for it. I schedule a 15 minute break every two hours and it is SACROSANCT. It’s when I eat, I recharge, I catch my breath. When I have a front person, it’s a bit easier to get the relaxation I need, but when I am running solo, there is often a person who walks up and says “Look, can’t you take your break later or something? I need a reading now.” (In fact, at a recent show, one fellow leaned over my table and boomed, “Hey, I saw you eating lunch yesterday. You don’t need to do that again today; my wife wants her reading now.”) I guarantee you that they will not get to sit down with me. For one thing, it shows that they don’t respect boundaries. They don’t respect me as a human being; rather, they see me as a commodity to order up like a burger or a latte or a car wash. None of these is likely to endear them to me and get me to want to do my best readings for them. Also, if a client wants to come up and chit-chat or ask general questions, I smile but explain this is my only recharge time, and I will be glad to chat with them after the break. Yes, it would be easy to talk while munching if it’s not a reading, but then where is my focus on myself in order to dissipate the energy of the last two hours of readings?Whether you create a break system the way I’ve engineered, or mark off a full space of time for a meal, make sure that you take that downtime for yourself. And if you have a printed sign-up roster, make sure that time is already marked out there; you and your clients will see it in writing and you’ll be far less tempted to skip it. I don’t t over-schedule myself outside show hours. I had four friends in the metro New York City area who found out I was doing a show close to them, and they all wanted me to stop by after the show, or take time during the show to just sit and shoot the breeze with them. That simply wasn’t possible. Shows are where I make my living, and I am single-minded about that. And at the end of an eight- or ten-hour day, driving an hour and visiting for another two more means I will get three to four hours of sleep at most. I certainly won’t be at my best the next day for my clients, which completely defeats the purpose of the trip. So that’s how I take care of myself at shows. What about at home? Because I work weekends, I don’t have the same two-day off time that everyone else does; in fact, I work six days a week, not five. The day before a show is taken up with driving, which leaves me four days to work at home. Mondays are always catch up days. So that leaves three. Right in the middle is Wednesday, and that’s my one day off. 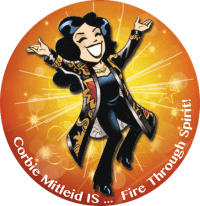 I won’t do readings, I won’t do work, I won’t schedule anything that requires me to be Officially Corbie. It’s the day I do errands, go to the chiropractor or the massage therapist, get my hair and nails done, and have Date Night with my husband. If someone absolutely needs a reading on a Wednesday, I will send them to someone on my list of colleagues that I consider reputable and professional. Why so strict about Wednesdays? Because when I used to work seven days a week I would find myself overly-exhausted and strung out at least three days out of the month, and my marriage was the worse for it. No amount of money is worth harming this wonderful partnership I’ve found. Not a million dollars, not any amount of fame. So: for me, Wednesdays are Off Limits. Make sure you have the same kind of Off-Limits-To-Work day scheduled for yourself as well; in the long run, it will keep you sane, sharp and at the top of your game the other six days. There is always a cancellation fee for my client’s missed appointments. In order to make clear to them that this is as legitimate a rendezvous as one with a doctor, dentist or lawyer, I get the credit card information up front and tell them that if they don’t cancel by a certain day or time (anywhere from 24 hours for general readings to eight days for my Soul Plan readings, which gobble up a whole workday), they will be charged a 50% Missed Appointment Fee. I can’t stress it enough — do this for yourself. If you do parties, take a nonrefundable deposit. Otherwise, it’s always a gamble whether your client will show up, forget, or just blow you off. And you can’t do your best work if you aren’t sure your schedule is truly filled, or if you’ll actually get paid when someone says they need your services. Keep learning. Not because you’re not good enough already, but because it’s always good to rattle around the mental marbles and see if they fall in a different configuration. I am not a workshop junkie; it’s rare that I attend one any more, because in one way or another I’m probably teaching what they teach already, and those events can be darn pricey. But I listen to podcasts and radio programs and watch videos, because I am part of the community, and I want to know what the community is thinking about these days. And lastly: take time to be with yourself. Whether it’s meditation, or just sitting outside basking in the birdsong and the wind in the trees, or curling up on the sofa with a book listening to the rain rattle the roof, take time to Just Be. Bring yourself back into your body, into the moment, in order to savor this amazing career you are creating for yourself and the magnificent chance you’ve been given to help heal the world. That single action is the headiest wine, the most potent drug, the greatest gift you can give yourself. And it’s the one that will allow everything else we’ve talked about to become a loving, easy dance as your career unfolds.